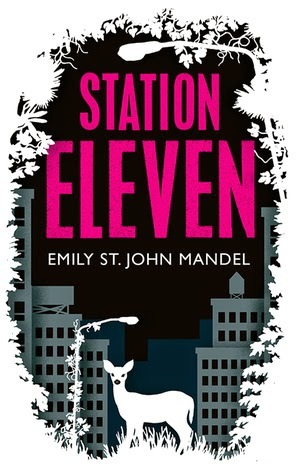 Told through multiple perspectives, centring around a famous actor who dies on the first page of the novel, Station Eleven is the story of what happens to the people left after a deadly virus wipes out most of the world's population and leaves us with no internet, electricity, or modes of travel other than walking. It is an odd mix of Peter Heller's The Dog Stars and Shakespeare, and as the travelling Shakespearian actors who perform in the settlements say, Shakespeare is the only playwright for the end of the world, because he was so much defined by the plague. What exactly this means is lost on some of the younger players. On the opening night of King Lear, Arthur Leander dies on stage, apparently of a heat attack. A member of the audience jumps up on stage and attempts to resuscitate him. This audience member is a paramedic named Jeevan Choudary but he used to be a paparazzi, and this is not his first encounter with Arthur. Watching from the wings is young Kristen Raymonde, a child actress. Both Kirsten and Jeevan survive the epidemic, and their lives are changed forever, but as they struggle towards something that they can call home, they continually return to thoughts of Arthur and the impact that he had on their lives, unable to separate the death of this man and the horrifying end of the world that happened that same night. The book switches between being a post-civilization action novel, with people being kidnapped on the road, and evil prophets, and being a complex drama about human relationships. It is compelling, well plotted and peopled with likeable characters, but I cannot help feeling like it doesn't quite do enough to separate itself from the myriad other novels that have explored the collapse of human society before it. The addition of the Travelling Symphony, who go around putting on Shakespeare plays and performing concertos is lovely, and oddly seems to make sense but it's not quite enough to make this book stunning, which it certainly has the potential to be. However, I did enjoy reading it. I particularly enjoyed the inclusion of the mysterious comic book series, owned by Kirsten and created by Arthur's first wife, although they never discover this connection along with the reader. A little bit of dramatic irony never hurt anyone, and it is distinctively Shakespearian in its use of coincidence! The comic books serve as a system of meaning and understanding the world in the absence of anything else to understand it by, and for Kirsten it means hope. For the prophet, it is more like the edict behind religious fundamentalism.